Today is the 160th Yahrtzeit of the Maharam Ash - Rabbi Meir Eisenstater. He was one of the great rabbis of Hungary. He was born in the city of Eisenstat (hence his surname) which is now Austria. 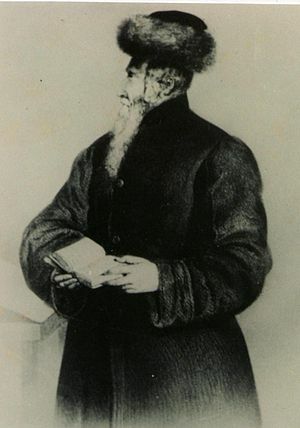 He was one of the first students of the Chatam Sofer - Rabbi Moshe Sofer (Schreiber,) studying in Mattersdorf and afterwards Pressburg, and was accounted for as one of his greatest students. He acted in the capacity of Av Beit Din in various cities, Ungvar being one of them - where he set up a large Yeshiva where hundreds of students studied - amongst them many of the greatest rabbis of Hungary. After the death of his teacher, the Chatam Sofer, people turned to him with questions in Halacha. From then onwards, he stood out the most as the spiritual force of the Jews of Hungary. His responsa are published in his two volume work "Imrei Eish."